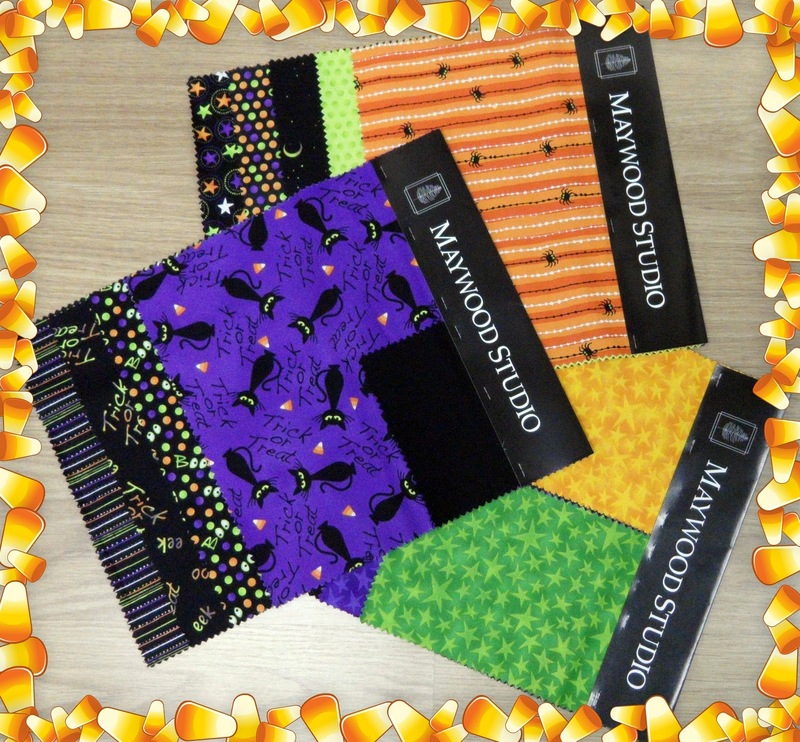 Remember that great bargain I got for 99 cents for the sample fabric cards. This is what I was able to get out of the three of them. Pretty good for a few dollars I'd say. I had to buy the orange fabric to get the look I wanted and of course backing and binding, but I'm really happy with the outcome. 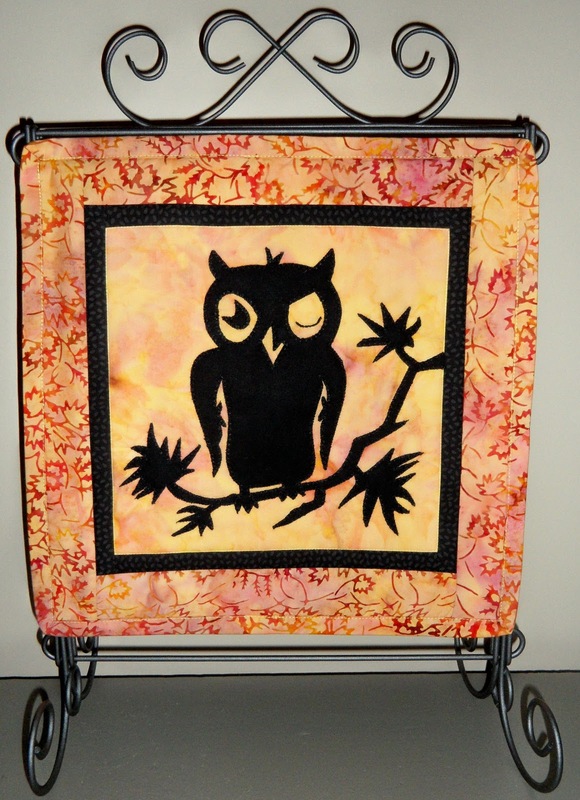 This quilt is made using the Lazy Angle Ruler and Jaybird Quilts' pattern called Unwind. This is another little mini hang-up I designed. I love the silhouette effect you get with black batik against the colored batik. This is one of my favorite so far. The pattern is available at Kindred Spirits Quilt Co. I've been on this kick lately of designing 12 X 12 mini Hang-up's. You could say I'm hung up on them. Here is Ghostly Boo just in time for Halloween. 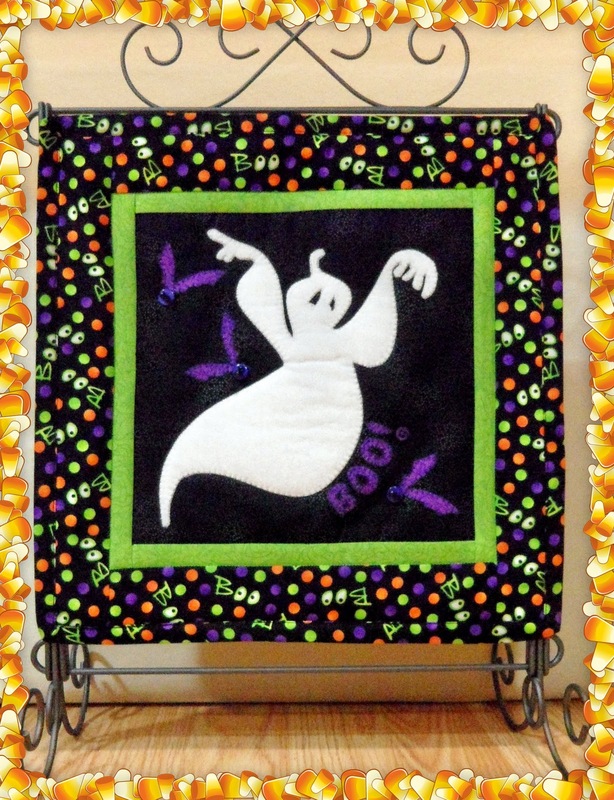 The ghost has a thin layer of pellon fusible fleece behind it to make the ghost puff out. The bats have button and black beads for the eyes. The pattern is available at Kindred Spirits Quilt Co. I love the way this cat's eyes pop out from the quilt. 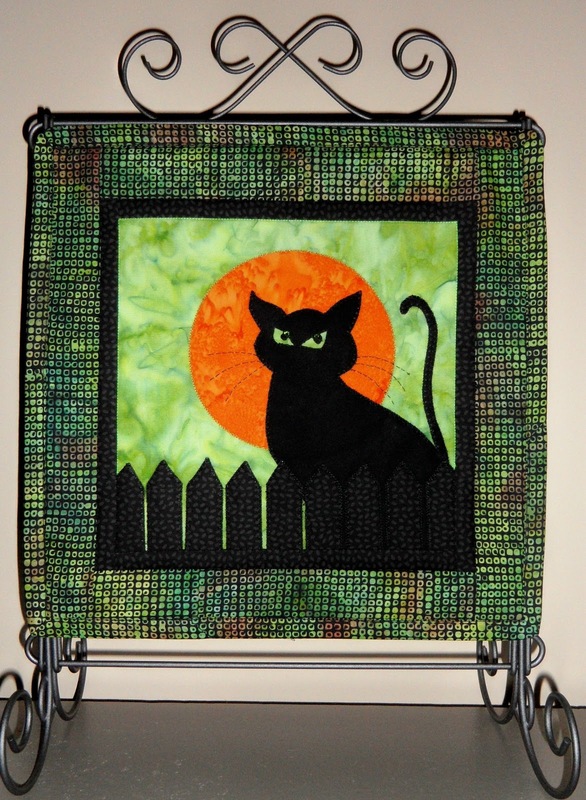 The eyes are cut out from the black batik, then a small piece of green background fabric applied behind, then the moon behind that. I added green Swarovski fix crystals for the pupils of the eyes so the shimmer. This is another designed mini hang up I completed recently. 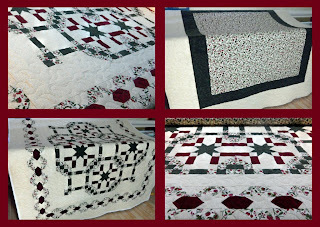 The pattern is for sale at Kindred Spirits Quilt Co. It all started with a little drip! My dear hubby, bless his soul, is not a plumber. When he said, " I'm gonna fix that drip on the kitchen sink", I just knew it was not going to end well. He told me that he just had to go to Home Depot to get a free replacement cylinder . I should have told him that nothing in life is ever free...but I kept my mouth shut!. Off he went on Day 1 to get his free replacement part. Came home and proceeded to install it. A few hours later and after much _)*@!*$+!&(_!$&!+)$&$!)&$!) from the kitchen he says " I'm gonna have a quick nap". Off he goes. When he gets up he says the bloody thing got stripped, and why don't they just make things that are easy to install. He says he has to go back and get another thing a ma jig from Home Depot that he accidentally stripped. Oh yeah, and he asks if I can call my brother who is a handy man to drive down (40 minutes) to help him....Ahhhh NO! 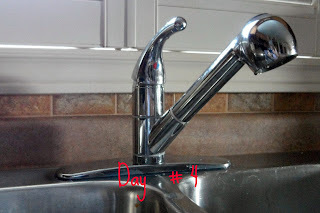 Day #1 without water, tap or sink. Day #2, much the same as Day #1, more (&)@$_&_)$&Q_)@&$Q()&@ and then he says he's going for his nap. I went out, came home hours later, he's up, hands me the computer which has a few tap samples displayed and says "Pick one!" I did. He goes to hockey and says that he'll stop on the way and pick it up. Says that the old one is 7 years old anyway and we're due for a new one. Ladies...I'll have you know I'm still keeping my mouth shut. Day #2 without water, tap or sink. 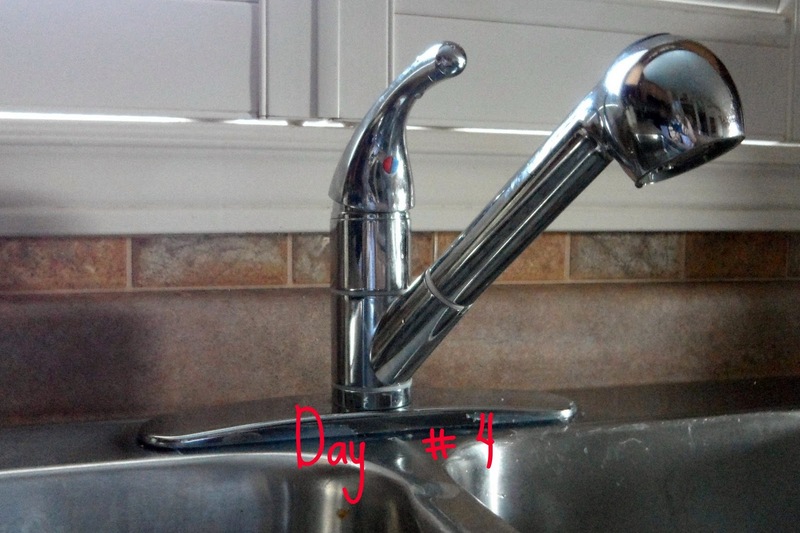 Day#3...got my new tap...things are looking up. 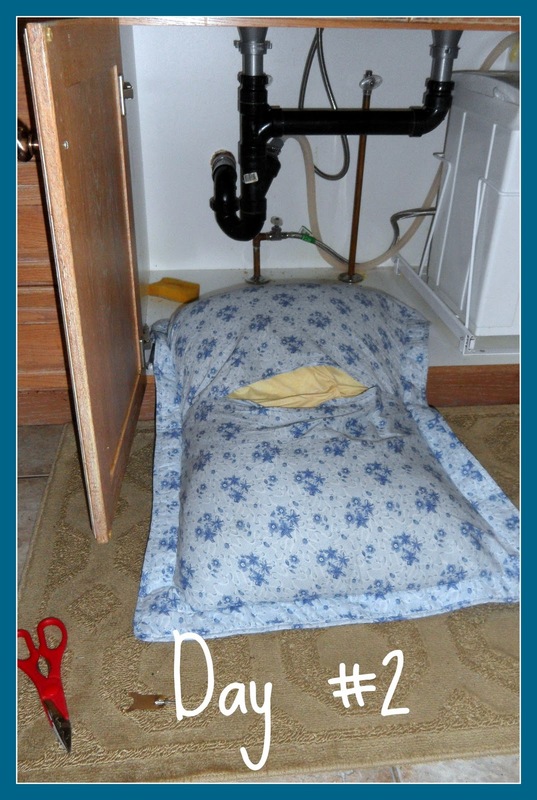 I'm out for the day and come home to find....no new tap installed, no hubby...yep....he's gone down for his nap. )(&&_Q&@$(* When he gets up he says he thinks he's got it now. Thank god! He needs these flexible hoses to attach the water lines. Off he goes to Crappy Tire and calls about 15 minutes later. Asks me to measure the distance between the tap and the pipes under the sink. I measure and add a few inches for good measure, cause I think I know what's gonna happen...too short right? Wrong. He comes home, they're too long...my fault. Away he goes again to get smaller ones. Now it's late, he's tired and he's going to go to bed. Day #3 without water, tap or sink. Thank god for Day #4. He gets up early, and bless his heart, voila, I have a new tap! He gets me to try it out. It has all the bells and whistles, even pulls out so you can spray with the hose. So that free replacement part cost us $129.00 for a new tap and parts. See I told you nothing is ever really free! As I'm admiring this new wonderful addition to my kitchen....it drips a tiny, glistening bead of water from it's flashy chrome spout....Ladies, I kept my mouth shut! 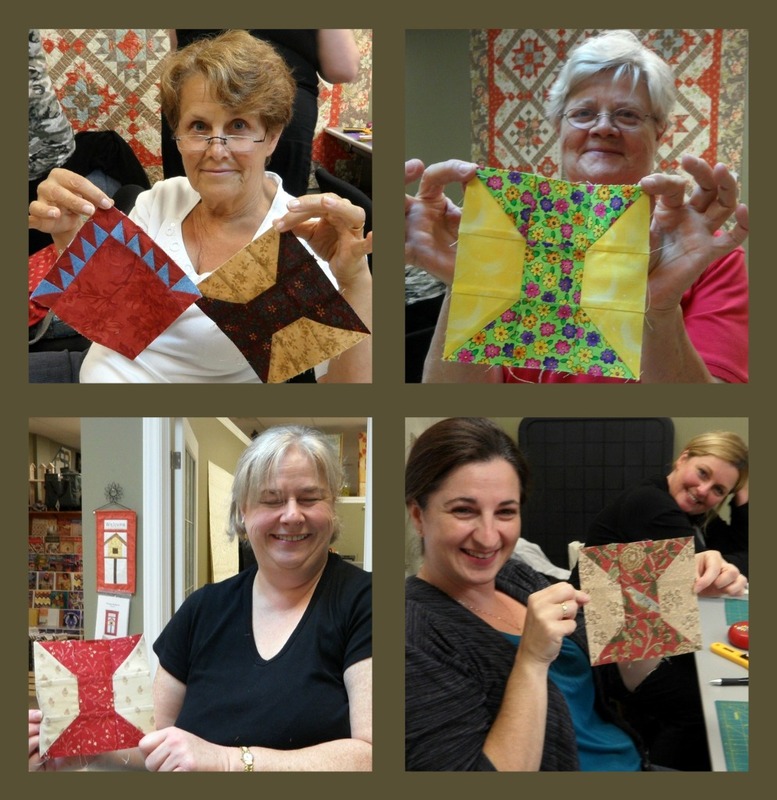 These are a few of the ladies in my Farmer's Wife Quilt Along class at Kindred Spirits Quilt Co. We are having so much fun together. 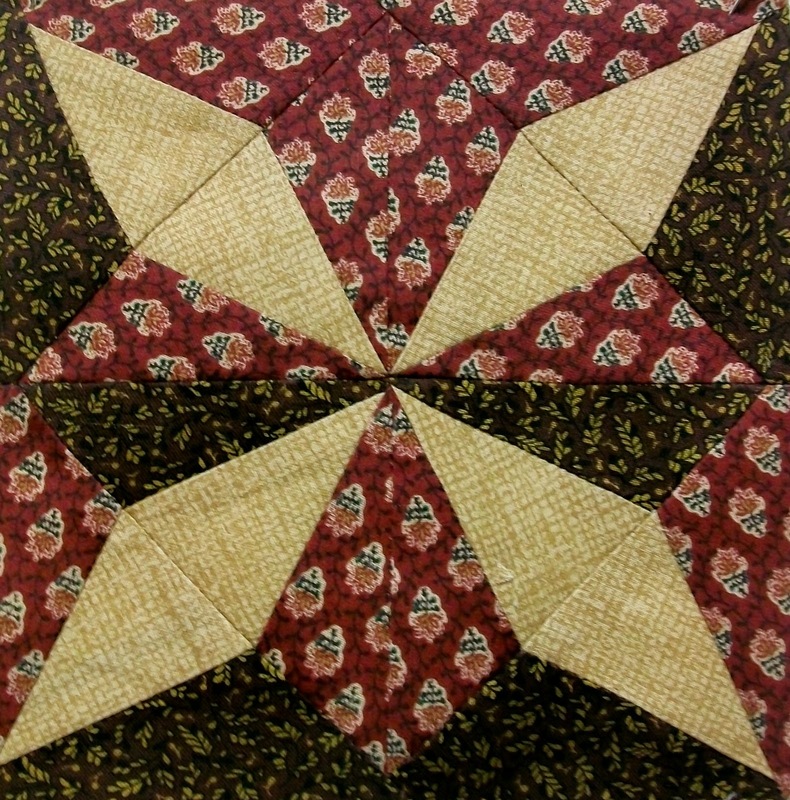 Some of the ladies are very new to paper piecing, however are doing an amazing job of their blocks. What troopers! We have Kathie, Rene, Bernadette and Michelle. There's also Jane sneaking peaking in as well. 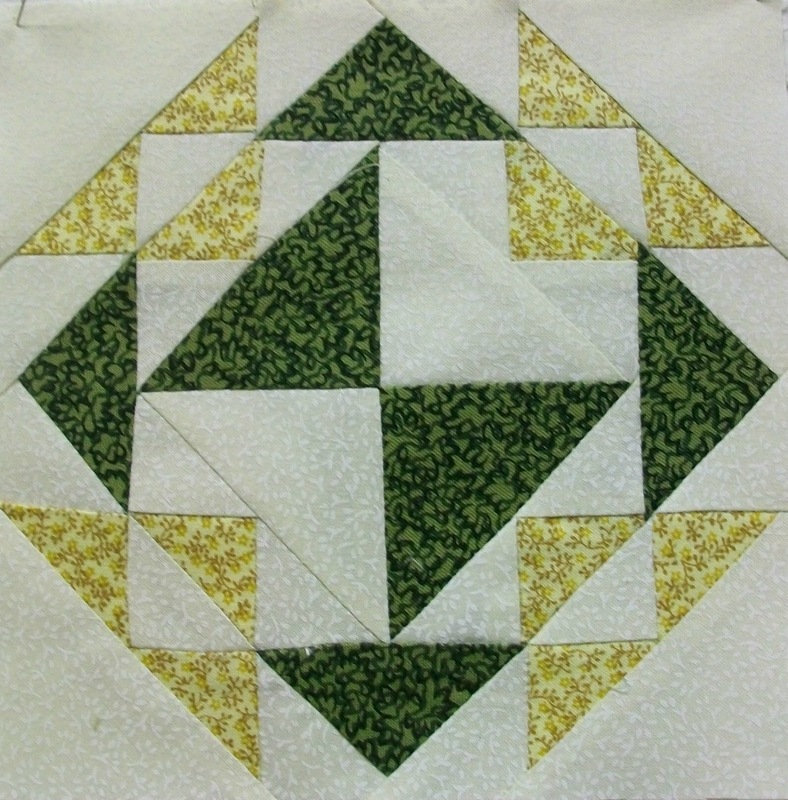 Jane is joining the group, but has been hand piecing her blocks for a few months now. Here are the newest ladies in the beginner quilting class at Kindred Spirits Quilt Co. There is Sue, Annamarie and Linda showing off the start of their first blocks. They are doing so well, after a few attempts to get the perfect 1/4 inch seam. 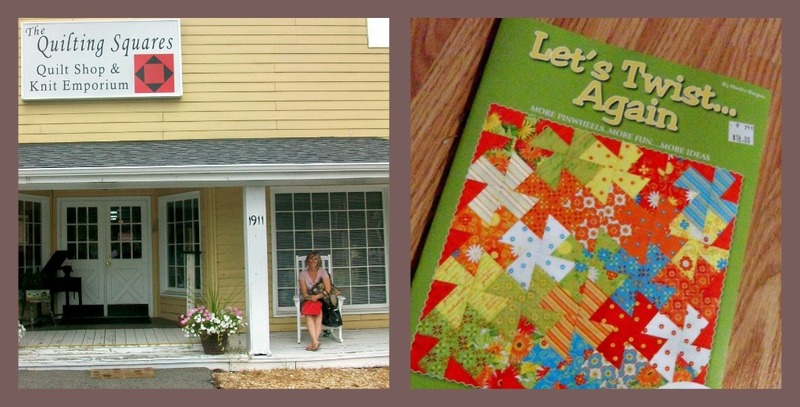 Their color choices and fabrics are beautiful and I'll be sharing more of their quilts with you. I love making pincushions and this is one of my favorites. It has little felt shapes tacked around it... a bat, a cat, and little strung black buttons. I really like the Halloween themed pins that go with it. When we were at the Checker's Distributing Open House this summer they had this small area where they offered special items like books, patterns and the such on sale. Near the back of the area, where there were a hundred women digging through boxes like it was the last fabric sale on the earth, were these fabric sample cards that the companies use to show the new fabric lines to shops. Some of the cards had layers of fabric on them, some as much as maybe about a yard total of the line. They were selling them off for 99 cents. I picked up a few and figured I could make a scrappy project from them. For 99 cents I couldn't go wrong. 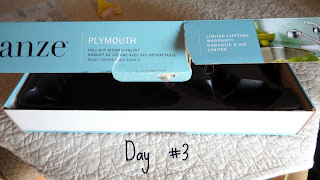 I'll be sharing that 99 cent project with you shortly! What a deal I should have bought a truckload more. When my daughter recently had her second baby Owen, I decided not to send or take flowers. I figured both she and her husband could do with chocolate after the birth. 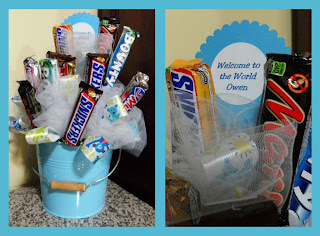 Typically new moms tend to get a few bouquets of flowers at the hospital and I wanted to give them something different that they could enjoy. Let's say it hit the spot, with both themselves and the nurses! I have been having so much fun working with the Lil Twister ruler. There are endless possibilities to the projects you can create with it. This is really fun for Christmas, the Lil Twister wreath. Do you know it's only 65 sleeps til Christmas? You still have plenty of time to make one of these. Wow, 22 down and 89 to go. I have really been enjoying these blocks. Some are more challenging than others, but all give me a sense of accomplishment when I finish them. This block is called Corn and Beans. Years ago I probably would have given up at this point. I must have developed more patience over the years and a true appreciation for quilting because I want to keep going and see what the next one looks like finished. 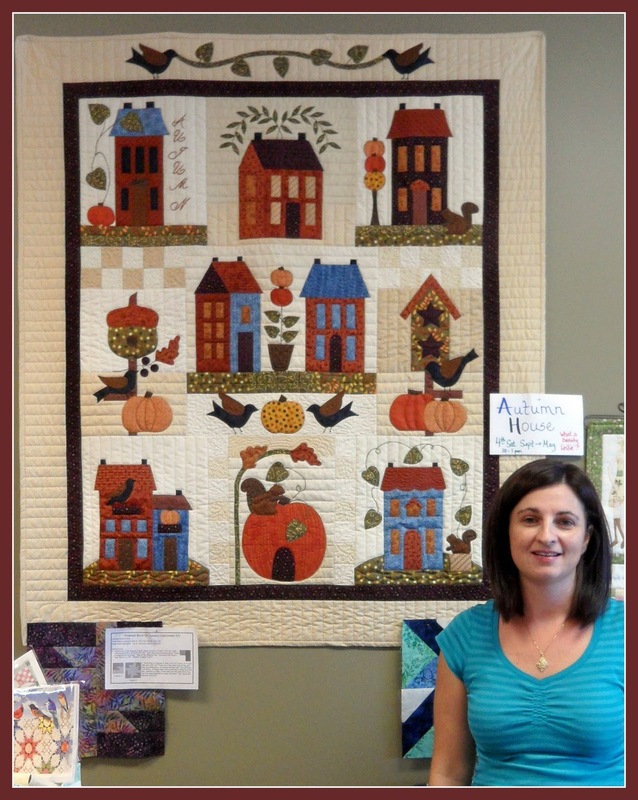 Autumn House is complete and hanging at Kindred Spirits Quilt Co. just in time for fall class registration. This is Michelle the store owner in front of the quilt, delighted that classes are filling up for this beauty. 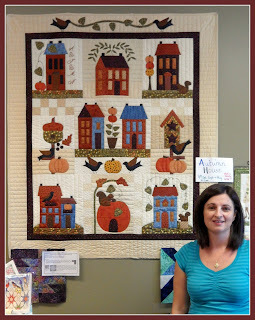 I love this quilt pattern from Bunny Hill Designs...last year we offered Tiny Town and it was a delightful quilt, but Autumn House is my favorite so far. Can't wait to see what we offer next year. This is one of my favorite blocks so far from the Farmer's Wife Sampler Quilt. It's called Contrary Wife. 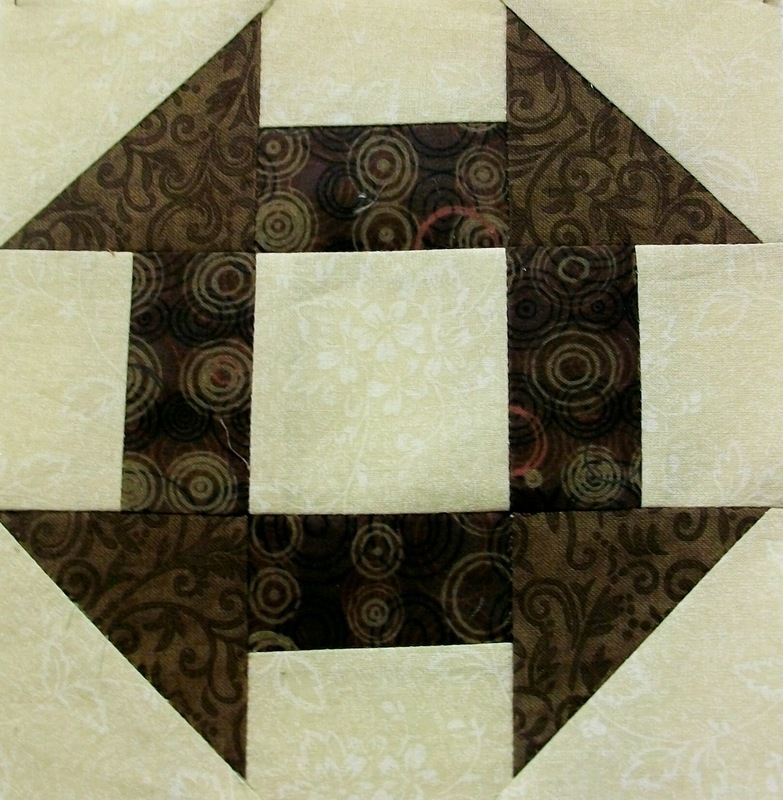 Maybe it's the fabric I picked, or maybe just the simplicity of the block, but I just like it. Pam brought me this a cute baby quilt to longarm. How sweet. It is a flannel panel that she added additional borders around. Little itty bitty clothes. Teddy bears and smiles of joy Oh! my gosh its a little boy. 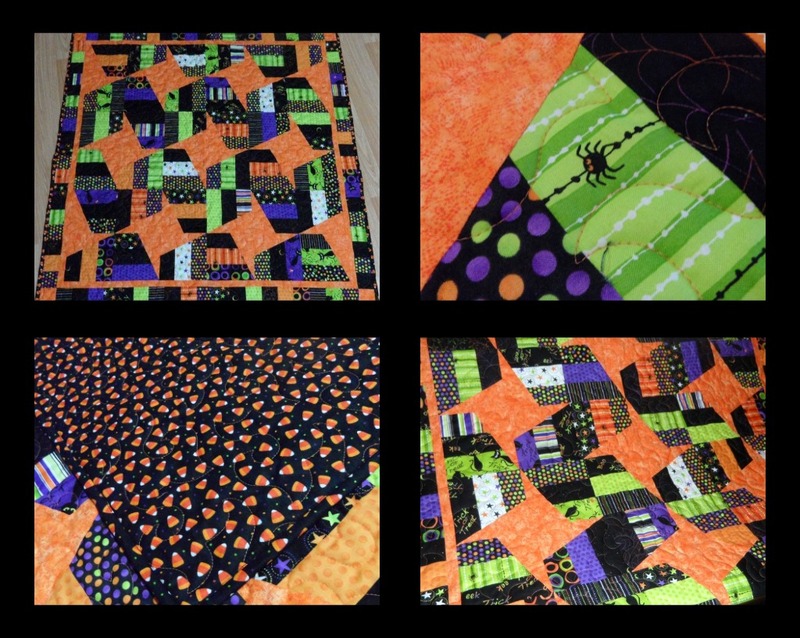 This is one of my student's mystery quilts completed. It's the Border Creek Station Mystery pattern called Travel by Day. 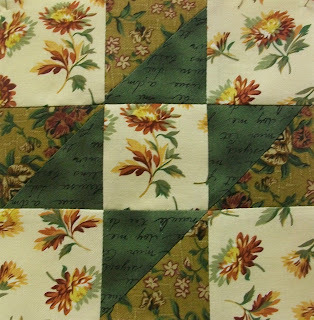 Rene chose flannels and even pieced the backing of the quilt as well. It is a Christmas print flannel so it will be wonderfully cozy this season for her to cuddle up under. 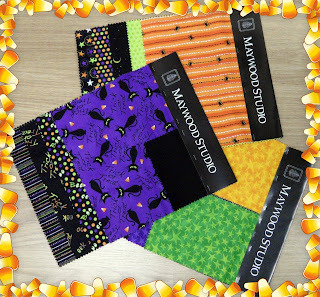 I designed the pattern called Black Magic Dresden and am teaching it at Kindred Spirits Quilt Co. The pattern allows for quilters to learn how to make a basic Dresden, applique, sashing techniques and setting your quilt on point. One of the bonuses at class is learning how to make a perfect circle with my Cuttlebug machine. The circle of my Dresden plate measures 3.5 inches. I order a 3.5 inch circle die to fit the machine. All you do is adhere wonder under to a 4 inch strip of fabric,. Cut the strip into 4X4 inch squares. Lay the fabric on the die, add your two acrylic plates, one to the top, one to the bottom, turn the handle and allow the die, plates and fabric to go through the machine. Voila....a perfect 3.5 inch circle. It just doesn't get better than that! 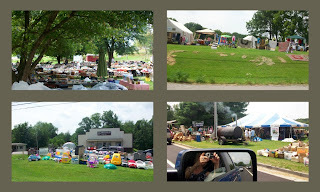 One of the things on my "bucket list" was to "do" the World's Longest Yard Sale. My husband and I accomplished that this summer on our trip to Nashville. Wow what an adventure. It runs along the Highway 127 corridor in Ohio, Kentucky and Tennessee. Since we were travelling to Nashville on the same weekend it was hosted we decided to make a day of it. The drive was very pretty through the back roads of Kentucky and it certainly wasn't like anything we had ever seen before. Everywhere we looked during our 8 hour drive, there was a yard sale. Every driveway had one. Open fields became havens for joint yard sales numbering in the 20's and 30's. Towns transformed themselves to huge street sales of junk and treasure. You have to see it to believe it. Some of it was downright comical. Along the way I did come across quite a few quilts. Many were selling for ridiculous prices, or I should say not selling for ridiculous prices. The wedding ring quilt was priced at 380.00. 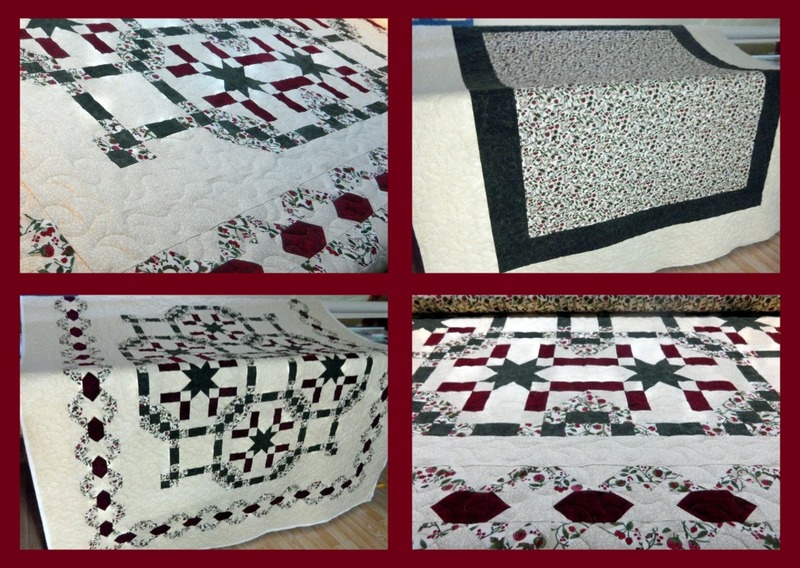 All hand pieced and hand quilted. The lady who made it said she couldn't sell any of her quilts. The economy was so bad, people just weren't buying anything. I felt for her, she was about 70-75 and she said her husband had lost his job and they needed the money. As a quilt shop...or at least that's what I tell my husband...I tell him it's a craft store not a quilt shop. I do this in the hopes that I'll get one more quilt shop added to the mix when we're travelling. He has this annoying habit of tabulating the number of quilt shops we stop at during a vacation. I think if he hits 10, his head will explode. I'm planning a long distance trip with him to Florida in January with stops at all the quilt shops along the way, I think it totals 15....such a shame. LOL. 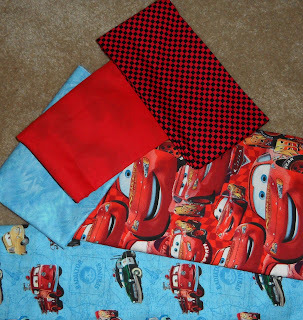 I did manage to find this cute fabric for a quilt for my grandson Ayden. His 2nd birthday coming up. 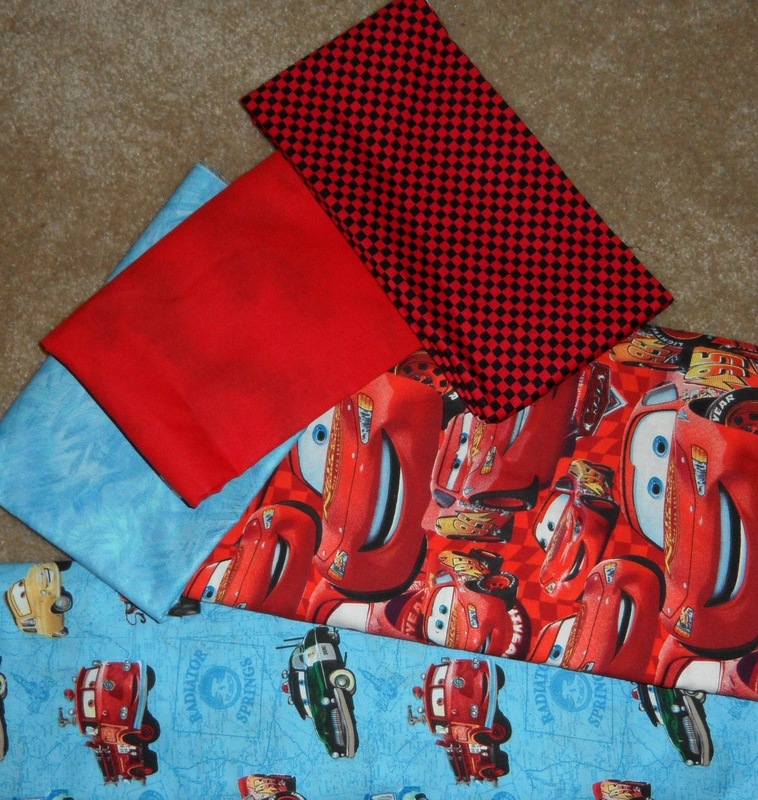 He loves "Cars" and will love this quilt. Gramma Fannie's Quilt shop is located at Schrock's farm near Millersburg in Ohio.....needless to say this was the shortest visit to a quilt shop in the history of visits thanks to Dear Hubby. I guess I can empathize with him as he'd just about had enough of quilt shops this vacation. I think it was a total of 8 or 9...I lost count. Really...he was very very annal patient. I had about 15 minutes, before he dragged me kicking and screaming from the shop came into and said "Honey, we should get going, it's getting late".....no, he didn't say that, but I can't print what he did say. I did manage to get a nice piece of backing for my "Santa's Little Helper" project... so it was time well sprinted spent. When we were driving to Checker's Distributing Open House near Toledo, most of the "Sew Sisters" tried to make good use of the 6 hour drive there. Jane did Farmer's Wife blocks, I made a felted pincushion and Margy made these adorable caps to donate to preemies at local hospitals. I was fascinated by the wool. It comes in a regular skein, but as you knit it makes a pattern. The one skein knits into a fair isle pattern. Too adorable. 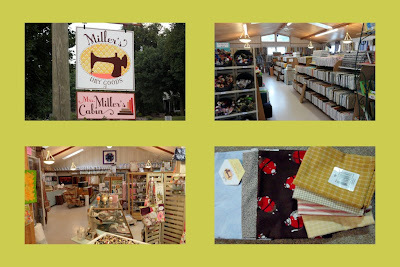 Miller's Dry Goods in Millersburg, although a challenge for us to find, even with GPS was a delight to visit. It's comprised of two separate buildings. 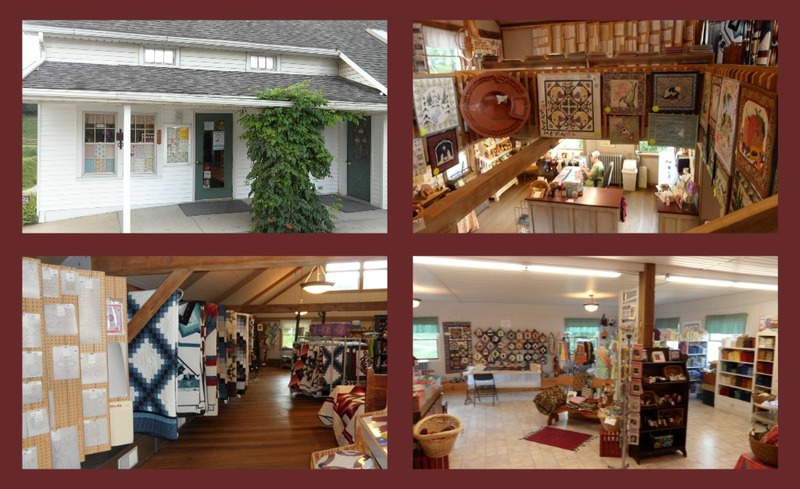 One houses the fabric, patterns and notions, the other, handmade quilts, gifts and kits. I just might add that you probably want to visit the ladies room before you venture there as there is no inside plumbing. In the heart of Ohio's Amish Country you'll find Miller's Dry Goods Quilt Shop. Dear Hubby was very patient finding this one. Our GPS took us down tiny little back roads that looked more like people's driveways than roads, through winding, curvy hills that must be a nightmare in winter, and landed us LOST. We had to stop and ask where the shop was. By this time I had to pee like a racehorse go to the washroom, however guess what...no inside plumbing at the shop. There was an out house, but I opted to have my tonsills float hold it. I did pick up a few little things. 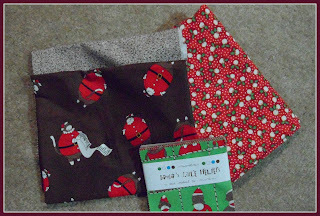 Fabric to match my "Santa's Little Helper" charm pack, pale blue (plain) batik, which I have been looking ages for and a few tea towels to embroidery on. I love a good "Churn Dash"...don't you? These blocks are very, very addictive. Bet you can't just make one. 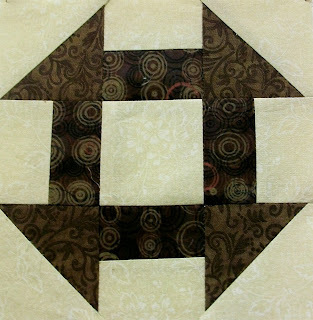 I absolutely love the paper piecing as the blocks go together perfectly. 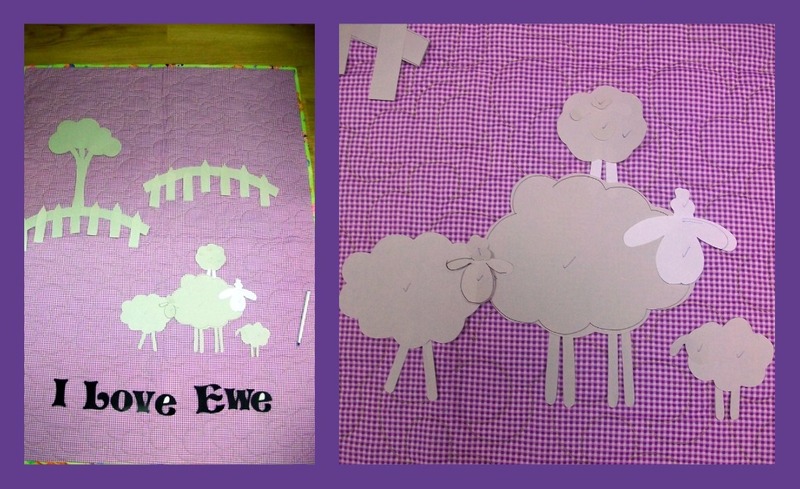 I'm teaching a class for Farmer's Wife once a month at Kindred Spirits Quilt Co. and the students are lovin' it as well. What a blessing that I found Little Blessings Quilt Shop in Crossville Tennessee. I was going into withdrawal on our trip to Nashville. We had spent the day in sweltering heat doing one of my "Bucket List" items. The world's longest yard sale. Little Blessings was located right at the end of our day trip and could not have come at a better time. I think the temperatures were well into the 100's that day and it was so refreshing to find a quilt shop let alone one that had air conditioning. See Dear Hubby there...he rarely ventures in to the quilt shops,except to tell me to get whatever I want, except to tell me my time is up, but this day he made an exception due to the heat. 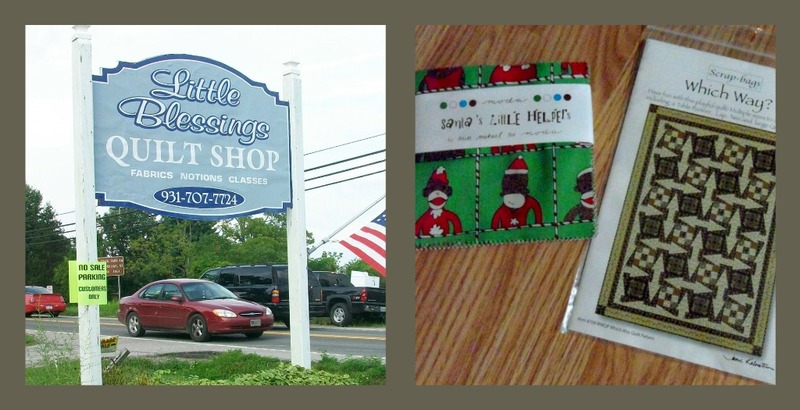 I bought a cute charm pack called "Santa's Little Helper and the pattern Which Way. I like the way the blocks were set wonky. We travelled to Nashville and on the way Dear Hubby was kind enough to make a few pit stops. 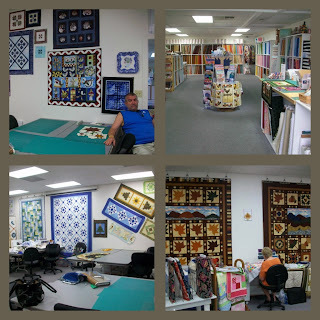 We visited Quilting Squares Quilt Shop in Franklin Tennessee on the way. What a beautiful shop...well stocked and very helpful staff. I picked up the Let's Twist Again book...have the first one and totally love it. I've done a few projects and am looking forward to doing more. 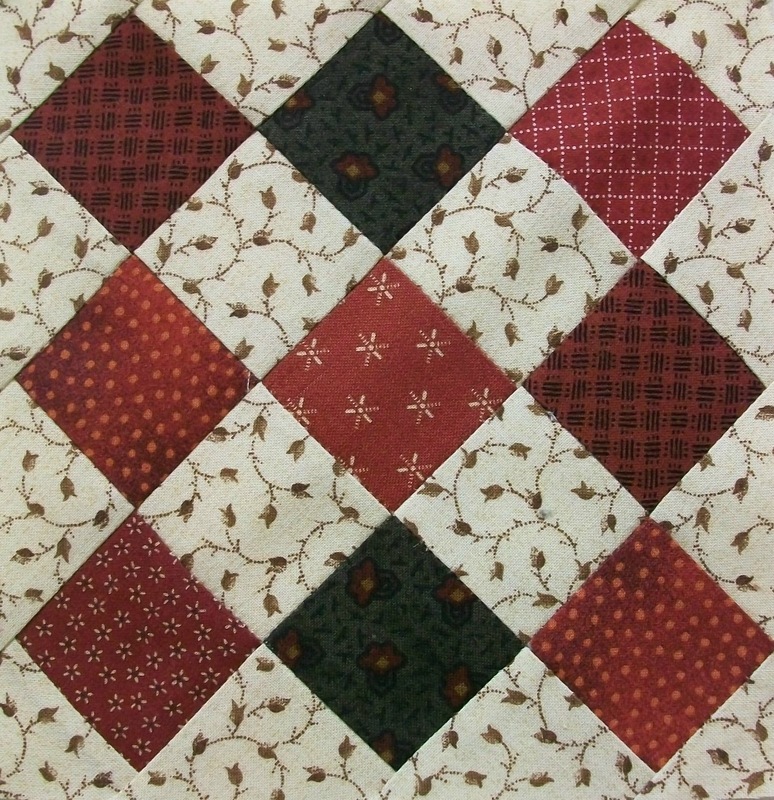 This is block 19 from The Farmer's Wife Quilt Sampler. It's called Checkerboard. We're having fun at the monthly class at Kindred Spirits Quilt Co. We meet once a month and complete 5 blocks(paper pieced). In ten months, that will give us 50, enough to complete the lap size quilt. Here's the brain-wave finished. I love the sheep. 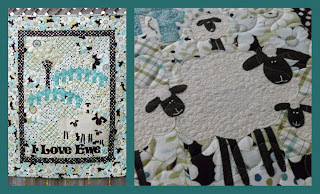 I quilted the whole piece in a pantograph, then went back and stippled the sheep's bodies. We are making another two color-ways for samples at the store. You know, it's always woulda, shoulda, coulda......shoulda made the background squares from fabric that were not so busy. It would have shown the applique better. It's all a learning process, and it still looks cute. Sometimes I do have brain-waves....and when I do I try to get them onto paper. Then I cut the paper out and put it onto a piece of fabric, or a plain quilt back and try to imagine it as a quilt. That's how I come up with my patterns. This is one in progress, before it came to fruition. It eventually became the Shop Hop quilt for Kindred Spirits Quilt Co. Lengthy process, but is works for me. This is "Century of Progress" from the Farmer's Wife, sampler's quilt. 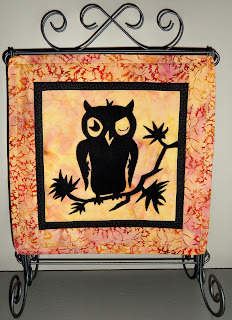 We have started a class at Kindred Spirits Quilt Co. and it has been very popular. So popular we have a waiting list for a second class. Everyone seems to really be enjoying it ....well, what's not to enjoy. When we were up to Hensall to visit my sister this summer it was nice to see how proudly she displays the quilts that I have given her. I love to give them to her as she really, and truly appreciates them. The large quilt that she displays on her railing as soon as you come in the house was a present for her when she retired a few years back. It's called Patchwork Diamonds from The City Stitcher Quilt Collection. It was one of the first quilts I completed. Dulcinea by Schnibbles is the smaller quilt and I made that for her kitchen table, but she like it better hanging in front of her wood stove. It was made from the fabric collection called Greetings from Canada.